William Greer Knapp, 49, a retired Navy commander who was a pioneer helicopter pilot, died Friday, January 8, 1965, at Bethesda Naval Hospital of cancer. Winner of an AHS Honorary fellowship award in 1955 "for outstanding achievement in the advancement and development of the helicopter," Cmdr. 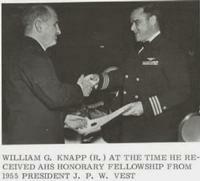 Knapp was the first naval aviator to qualify officially as a helicopter pilot two decades earlier. Born in New York State, he joined the Navy in 1940 after attending the University of Rochester and Michigan. During World War II he served in various submarines. Near the end ot the war he was transferred to the Brooklyn Coast Guard Air Station as a student in helicopter training. He was te first man to complete the course and earned Navy Helicopter Certificate No. 1. After finishing war service as a helicopter test pilot, Cmdr. Knapp became Chief Test Pilot for Piasecki Helicopter Corporation which is now part of Boeing Aircraft. During the next several years he performed the first and major test flights on several Piasecki models including the HXRP1, HRP1, HRP2, XHJP1. He returned to the Navy in the Bureau of Aeronautics, helping supervise Naval helicopter development. During the Korean War, Cmdr. Knapp spent three years in combat helicopter rescue and supply duty, serving as executive officer of Helicopter Utility Squadron No.1 when it received a presidential unit citation for its rescue achievements. Following this, he was assigned to a series of important duties in BuWeps including the rotary wing technical office and later, Plans and Program duties. Since 1957, he was a Bendix Corporation Washington representative.